YAY PONIES! This is an unusual sort of Christmas episode. Since Equestria has no relation to Earth, their midwinter festival is a bit different. It’s a holiday in honor of the founding of their land, and the friendship between the different sub-types of ponies. It’s clearly a Christmas-type holiday, though, complete with garlands, ribbons, bells, and a story from long-ago. 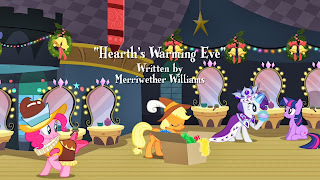 The main plot is that the characters are starring in a holiday pageant in Canterlot which dramatizes the story of the founding of Equestria. Most of the episode is this story-within-a-story, dramatizing the legend of the original leaders of the Unicorn, Pegasus and Earth clans. It’s about how their differences nearly destroy Equestria before it starts, but then their friendship saves the day. The warmth of their friendship drives away windigos, evil ice-creatures that feed on hatred and come close to starving all the ponies in an endless winter. I kind of love that under the ‘friendship’ story, it’s a classic winter holiday. It’s about driving back the winter, and the people’s connection with the health of the land. It's really a solstice special. I mean, if you like overthinking cartoons. Which I do. The tiny sub-plot about Fluttershy’s stage fright is cute, and all the characters get to exaggerate their normal personalities for their roles in the pageant. The episode closes with a traditional Hearth’s Warming Eve carol. The carol is cute, but not one of the better songs from Friendship is Magic, in my opinion. I did enjoy this episode, it’s sweet, but it’s not one of the best episodes of this show. But that’s because the show is awesome. It’s a fun little half-hour, though, and a fun holiday treat.